I was never more fiercely dedicated to the pursuit of love than when I was in the Grade School. My nerves were such that I only comfortable when I pursued it from a distance. The closer I got, the more inaccessible it seemed to me. This kind of love is the place in which Mud (McConaughey) exists. He is clear minded in his ideas of how he is going to pursue that which he loves. Right down to the shopping list of things that it would take to get a boat down from where it rests on top of a tree in a swamp, get it running and then pursue the object of his desire. There to help him on his journey are two boys, Ellis (Sheridan) and Neckbone (Lofland). Ellis is the product of a family that is breaking apart. The latter is his friend, who never did know his parents. The two boys found the boat, and had a mind to claim it for their own, when they discover Mud, a fugitive who is waiting to meet up with his girl, Juniper (Witherspoon). Ellis is taken by the earnestly whimsical nature of Mud. He has stories to tell and ideas expresses. Neckbone does not take to him so easily. Nonetheless, he is a dedicated supporter to his friend and dutifully follows as Ellis is reeled in. Mud is rife with characters that may be ignorant, but certainly are not stupid. In this way, his work is reminiscent of one of his literary heroes, Mark Twain. He also writes with a sense of the characters of William Faulkner. His characters are passionate and often startlingly intelligent while appearing to be disarmed and slack-jawed. As well-developed as the character of Mud is, it is all the more amazing to realize that he is more of a symbol of unrequited love as anything. The moment he comes closest to his love shows this. If he ever crosses the Rubicon of his ideal represented by Juniper, reality is dashed. The gist of the story is really coming of age. Ellis is seeing love challenged everywhere around him. He feels it fiercely as anything he ever will in his life. His parents are splitting apart. His mother (Paulson) seeks anything new beyond the river. His father (McKinnon), like anyone anchored in the old south, wants to stay on the river, eeking out a meager living and enjoying his misery. Ellis himself is falling for a girl (Sturdivant). He needs to see the love he imagines between Mud and Juniper to succeed so that he can know that he has a chance. The whole sad cafe blend of relationships is the most genuine feeling in a deeply realistic film. The acting, always a strength in Nichols films, is once more a highlight here. McConaughey has been this good before, but he is not this good often. He took a role written for him by Nichols and performed it perfectly. His presence suggests another director who Nicholas reminds me of: John Sayles. Nichols got the idea of casting him after seeing McConaughey in Lone Star. Like that classic (one of the best movies I have ever seen) the characters express so much more than just exposition for a story. They are metaphors, one and all, representing places in life, stages in life, trappings and freedom. Tye Sheridan is going to be a great adult actor one day. He is already a great child actor. His face expresses so much with every frame, the film could work with half of his dialogue. Michael Shannon’s time on the set was limited due to his filming Man of Steel. He is so at home in the worlds that Nichols creates that he can create a highlight from the smallest amount of screen time. Nichols claims that Shannon is the best actor in the world. I believe this to be so. I also think that Nichols may be the best director in the world at this point. He is definitely the best since Sayles released films like Matewan, City of Hope, Limbo and Lone Star. McKinnon and Paulson are exceptional, especially in the powerful scene about the stolen boat motor. The momentum is thrown so strikingly off kilter, only an actor like McKinnon could hang with the curve. Witherspoon is nearly unrecognizable as the cute starlet that we saw in Legally Blonde, or even Walk The Line. Her role as the temptress with a heart that is not necessarily pure gold. In a role that could very easily been a distraction, she serves her purpose well. Sam Shephard is right at home with good writing, and his character is an ironically essential outlier. On the other end of the acting experience spectrum, Lofland has an easy nature that fits within the environment as well as the story structure. His relationship with his Uncle Galen (Shannon), is very organic. There is a scene where one of Galen’s suitors walks out the front door after a romantic session. She implores the boy not to treat women like his Uncle. In the midst of her admonishment, she sees him staring at her breasts. She is aghast, and he just smiles. Like Uncle like nephew. The film is essentially a tribute to young love. That does not mean it is not a complexly dense. It’s a bunch of simple parts expertly constructed to be a thriller, a drama and a romance. 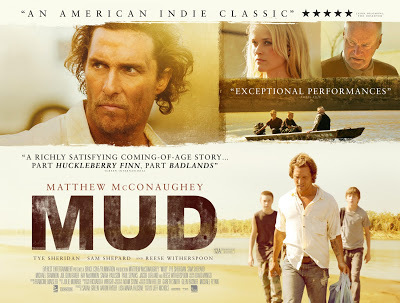 Mud is as rich as any film I have seen in the past year. It is a beautiful thing to have a director who is so in tune with life. I anxiously await his future work. Since I have grown older, the love is not as fierce, but it’s a lot wiser and deeper. Ellis will know this one day, even if Mud will stay frozen in time in his mind.